After 3 major surgeries, 3 outpatient surgeries, and 14 different medicines, with pain in my face every day, I was a walking mystery to most health care professionals. Along came Dr. Tapan Chaudhuri who was invited to speak to our Trigeminal Neuralgia Support Group meeting. As a “non-believer” I didn’t expect much from acupuncture but having been given little hope from other doctors, I was willing to try anything. Miraculously, acupuncture worked for me for a short time, but gradually began holding off my pain for up to 18 months at a time! I told our support group about my success and Dr. Chaudhuri now has done acupuncture on 38 members and been successful in relieving pain in over 90% of them! What a gift Dr. Chaudhuri has been to me and the others who have also been relieved by his acupuncture treatments. Now, I would try acupuncture for any medical condition as I’ve become a big believer in Dr. Chaudhuri and his acupuncture. My name is Deborah Richardson and I am writing a testimonial based on my experience with Dr. Tapan Chandhuri. I became associated with him from recommendations of other people that have experienced pain. I had a spinal fusion that left me with nerve damage. I have been experiencing extreme low back and groin pain for over six years and moderate pain for twelve years before that. My neurosurgeon and pain management team explained my fusion is stable because of my exercise routine and weight control. They had no answers for pain control since medications have not helped or I could not tolerate the side effects. During my first visit with Dr. Chandhuri, he was able to communicate with me that he would be honest concerning my health situation and could tell me in a few visits whether his expertise would be of benefit. I sensed a genuine interest in his approach to listen to me and he was fully engaged. His staff is friendly, compassionate, and regularly checks with you in the treatment room as well as phone calls to your home. They are eager to accommodate your appointments to fit your schedule. 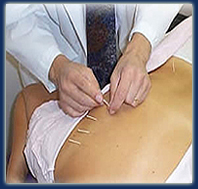 After receiving acupuncture treatments for three weeks, I noticed a 50% reduction in my groin pain. After four weeks of treatment a 75% reduction and after five weeks no pain in my groin area. My back and spine area gradually gets better each treatment. After five weeks, I now go every two weeks to check my progress. I would highly recommend the service of Dr. Chandhuri to evaluate anyone who experiences a medical condition concerning pain.